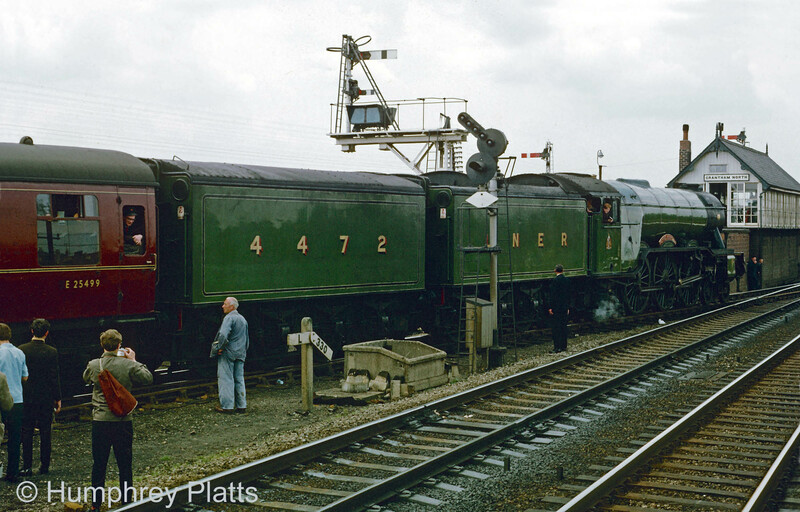 This page is a fascinating combination of photographs taken at Grantham by two photographers on the same occasion, but from different viewpoints. They show the arrival from London King's Cross of the Gainsborough Model Railway Society's Stapleford Park Railtour on Sunday 9th June 1968. The special train terminated at Grantham, passengers travelling forward by bus to Stapleford Park, near Melton Mowbray, for an outing to Lord Gretton's stately home with its 10¼" gauge miniature railway and lion reserve. The train returned to King's Cross from Grantham in the evening with diesel traction, Brush Type 4 No. D1760. 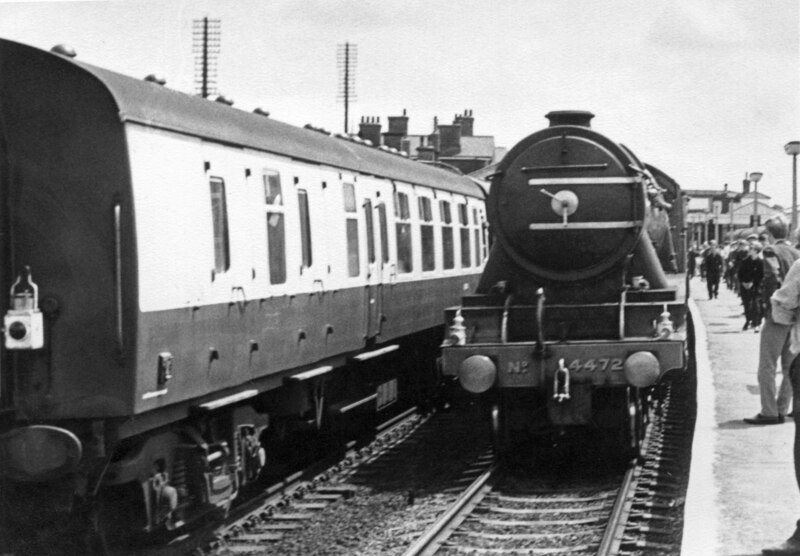 First, a set of black and white photographs kindly lent by Ken Willetts, a retired Grantham driver. Ken wasn't sure when the photographs were taken but it became clear with the arrival of the second set of pictures, of known date, that they show the above event. The pictures were taken by a shunter and numbertaker at High Dyke who was known as 'Digits' because he could take down the wagon numbers (digits) very speedily. No.4472 'Flying Scotsman' arriving into platform 3 at Grantham. Photograph lent By Ken Willetts. No.4472 'Flying Scotsman' draws slowly to a halt just off the platform end. 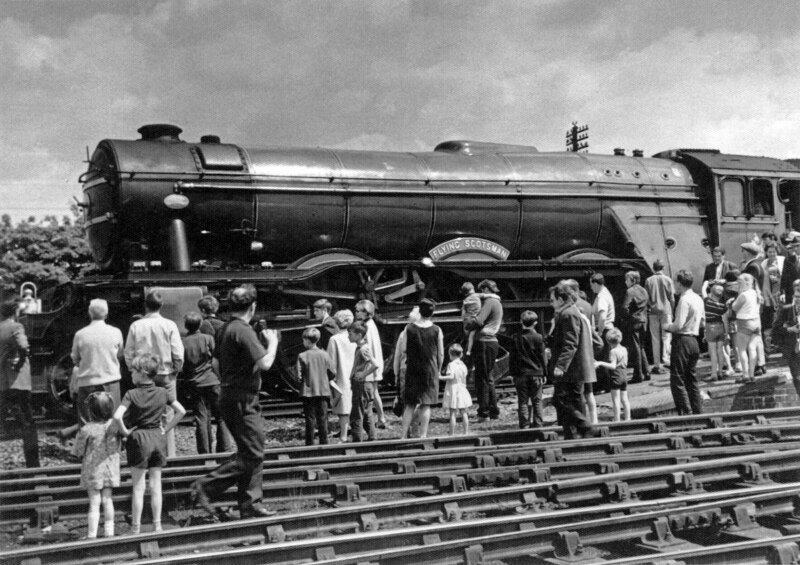 No.4472 'Flying Scotsman' at Grantham station. A signalman's nightmare! 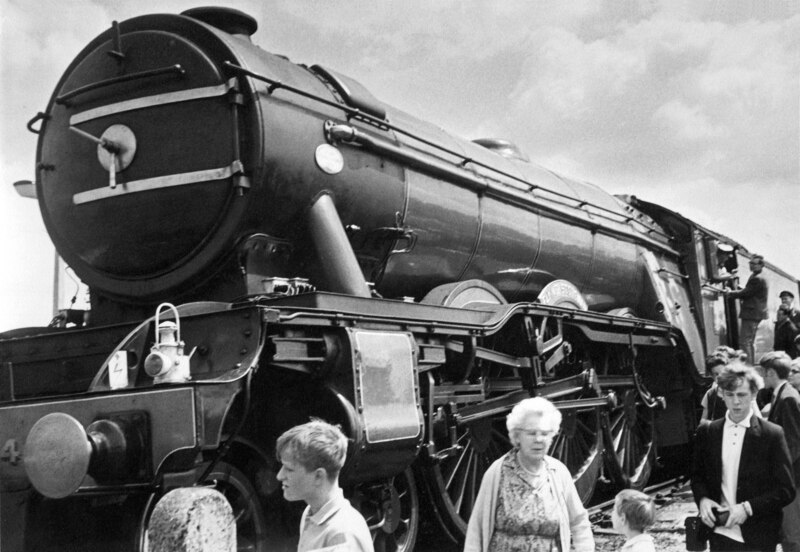 No.4472 'Flying Scotsman' calls at Grantham station. This is the view from Grantham North signal box. There's a train signalled to leave the Western Platform and take the Nottingham line, the track to the right of the signal in the foreground. With all those people standing on the track, quite apart from the danger of someone being struck by a train, there's a risk that if the signalman attempted to set a route by changing points a person's foot could be trapped. 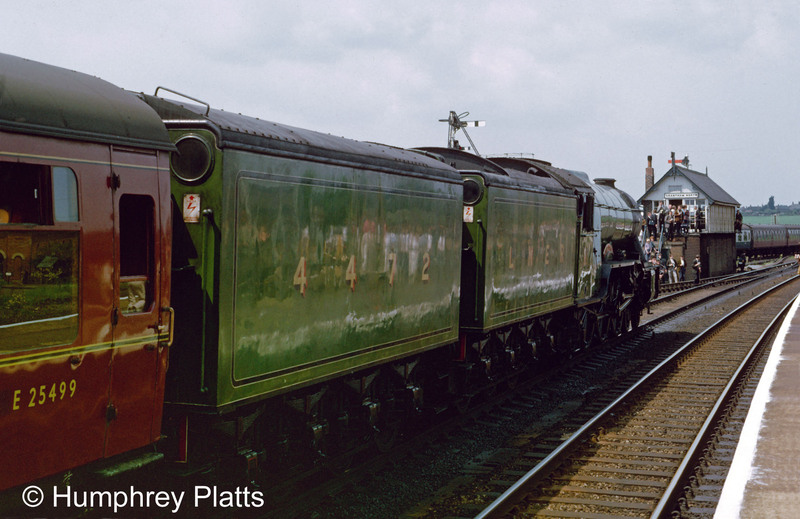 The second group of photographs were taken by Humphrey Platts from platform 2. He is probably among the people seen on the left in the shot above. No. 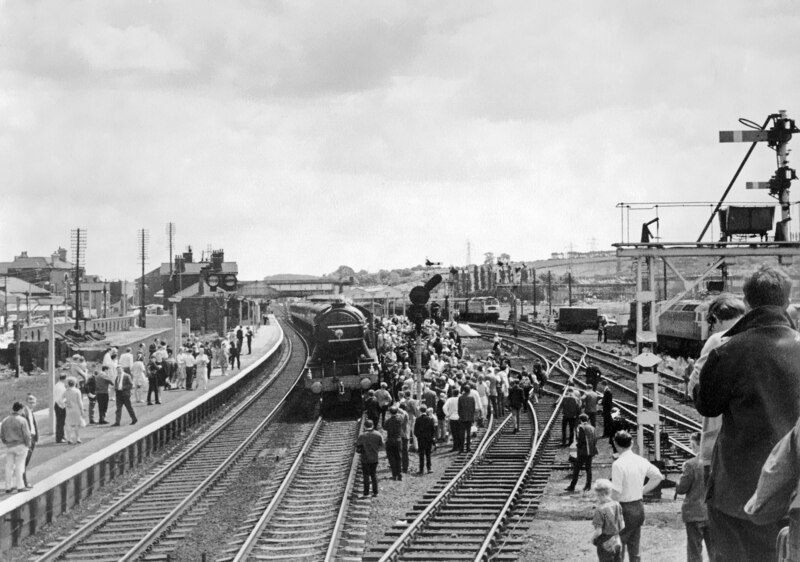 4472 'Flying Scotsman' has arrived at Grantham on 9th June 1968 with a railtour from London King's Cross organised by the Gainsborough Model Railway Society. The locomotive is running with an additional tender to augment its water supply. No. 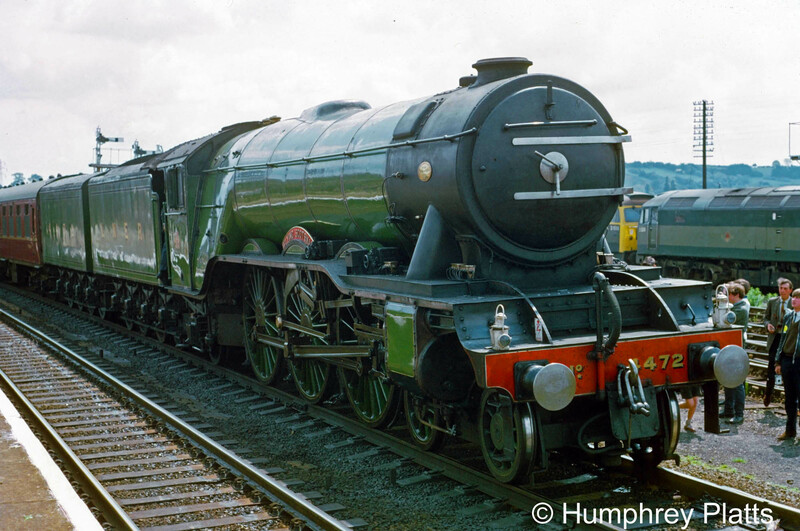 4472 'Flying Scotsman' at Grantham on 9th June 1968. Grantham North Box is thronged with spectators, one of whom was probably 'Digits' busy taking the last of the series of black and white photographs above. 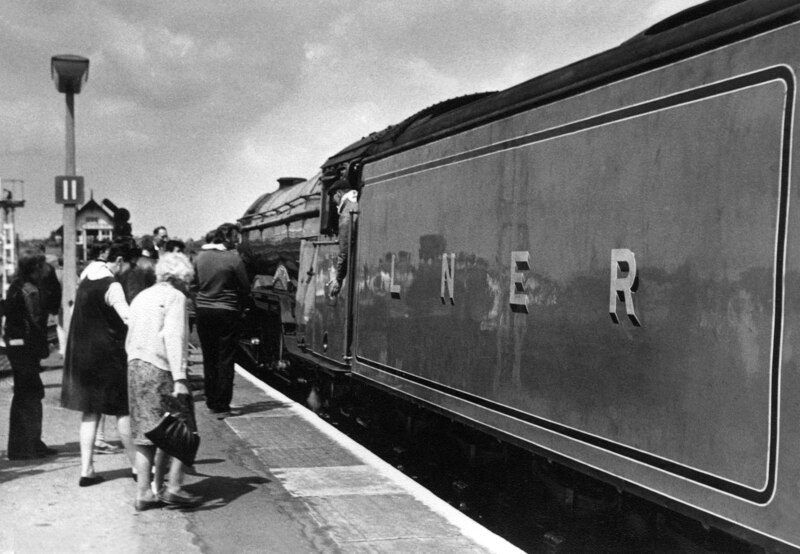 Flying Scotsman's nameplate and cabside LNER crest. No. 4472 'Flying Scotsman' has moved forward and now sets back into the Western platform, or possibly the carriage sidings, with the coaches to await their evening return to London King's Cross with diesel haulage.